There are three paths in A Rite from the Stars: Wisdom, Courage and Spirit. We have repeated this many times because we think it is a core feature of the game. Remember that Kirm can solve them in the order desired by the player. However, we needed a way to make this feature work properly. The whole game structure was created with the three paths in mind. 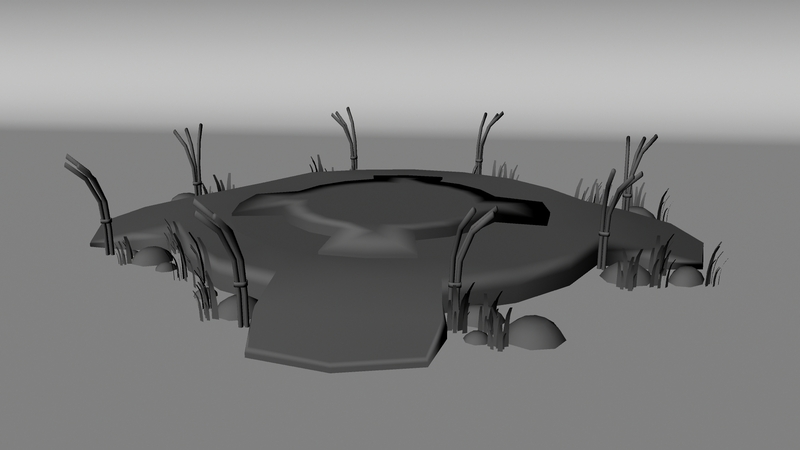 This structure is based on a scenario that we call “The Bonfire”. “The Bonfire” is a sacred area for the Makoa. Some remains of an ancient civilization that inhabited the Island of Kaikala centuries ago. This is the place where the rites of passage have begun for those who has been chosen by the stars for generations. And, of course, this is the place where the three paths start. Perfect, the game structure is clear. However, we found a problem. Every scenario must be connected to The Bonfire because every time Kirm goes far on a path, he is getting away from this sacred place (in terms of space). It would be an absurd design decision to force the player to make all the way to the Bonfire on foot. Kirm would have to go over beaten levels. Although we could have made a time ellipsis using a loading screen, sometimes it can be hard for Kirm to reach The Bonfire. One example (and it is not a spoiler, because it appears in the trailer) is the maze scene. If Kirm is lost in a maze it would be difficult (or even physically impossible) for him to return. Hoku, Kirm’s guiding star and inseparable companion, brought us the solution. We decided to give this character the ability to teleport Kirm back to the Bonfire. This star power solved the space problem that the game structure had generated. The discontinuous movement is explained now (or, in other words, it is explained how Kirm is able to go back and forth between every scenario and The Bonfire). It is important to point out that Hoku helps Kirm, but do not solve the rite for him. The star only gives him a rest. This is why Hoku doesn’t teleport the Makoa boy directly to the next level or to the end of his rite. However, this solution generated us another problem (although it was a lesser one). This is a common situation in game development (solutions that create problems). It is important to avoid entering into a death spiral of adjustments that turn everyone in the studio crazy. This problem in particular was: Where inside The Bonfire will appear Kirm and how do we explain it in script terms? From a game design point of view, the answer was quick: we found an equidistant position from the entrance of every path at The Bonfire. The reason was clear. It is highly unlikely that the player will choose to return to the same path that he was playing and we cannot predict what other path he will choose. Putting the teleport position at the same distance from every path entrance make sense (in addition it is at the same distance from the path that in wich Kirm was, just in case the player feels the desire of returning to it). Once again, we could make Kirm appear in the right spot and forget the problem. However, we wanted to ritualize (in story terms) this mechanic a little. ‘Magic Circle’. Two simple words that don’t need an explanation (we later changed ‘Magic’ to ‘Mystical’; it sounds more Makoa). There are a lot of cultural references in the modern culture to circles that are used to summon things (from devils to bread). So we only needed to draw a circle with Makoa ideograms on the ground to solve this matter. But it needs to be more appealing. It needs a texture. 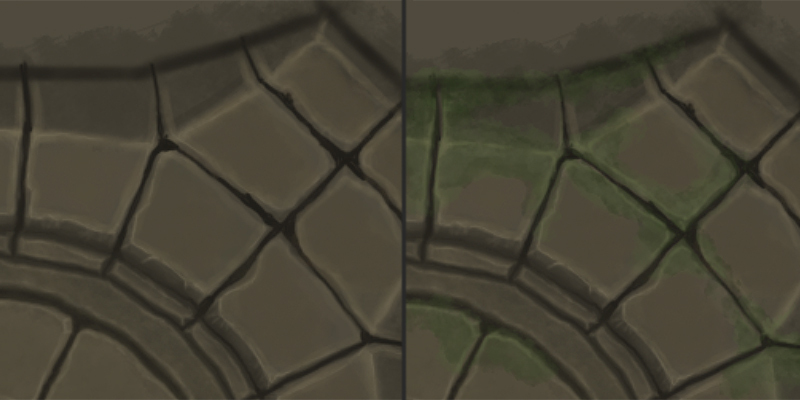 This is the texturing process in four steps (explained under the pictures). We extract a UV map from the 3D model. UVs are coordinates in a 2D plane of a 3D object. This allows an artist to paint it in Photoshop and texturize the object. The next step (using Photoshop) is defining the texture’s shapes and applying the first lights and shadows to create relief. 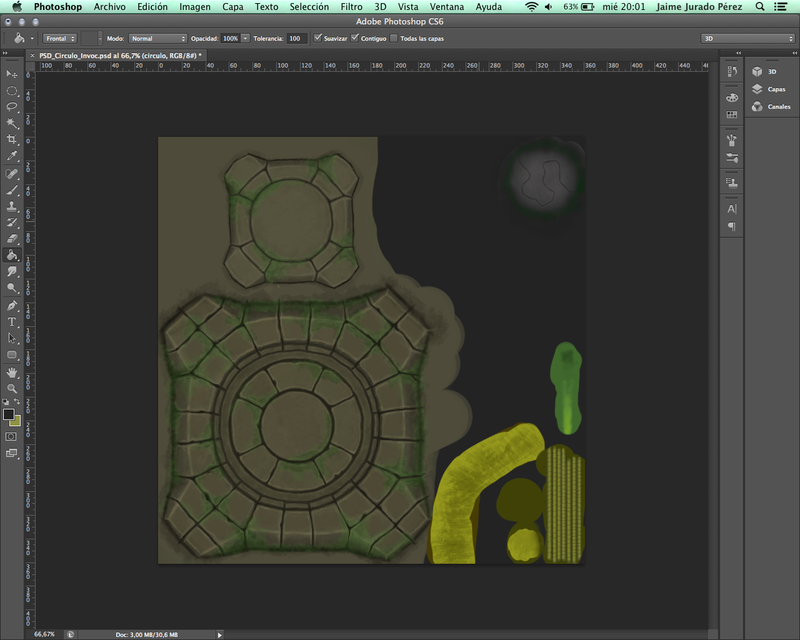 The UV lines helped the artists to draw the floor tiles of the mystical circle. Even so, this is a laborious work that needs attention to detail. First, the texture is applied to the model. This technique makes the material to not seem flat. 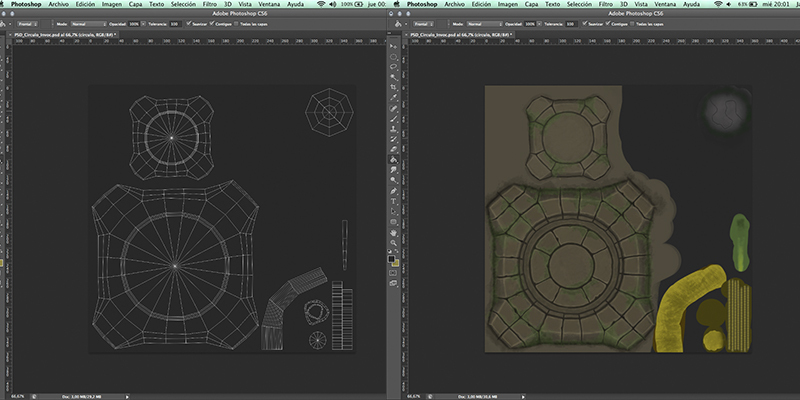 Then the main details of the texture are designed. In this case, floor tiles and inside circles..
After trying the texture on the 3D model, we realized that the ensemble seemed too clean. We added moss to show that the stone was eroded. The technique consists in applying green spots and apply lighting to avoid a flat sensation, while adapting them to the mystical circle’s floor tiles. Then we added the rock details, the sticks and the leaves. These elements are secondary so they do not need so much detail. Some strategic brush-strokes make a great result. Once the work is over, we have a JPG texture to apply to the 3D model. 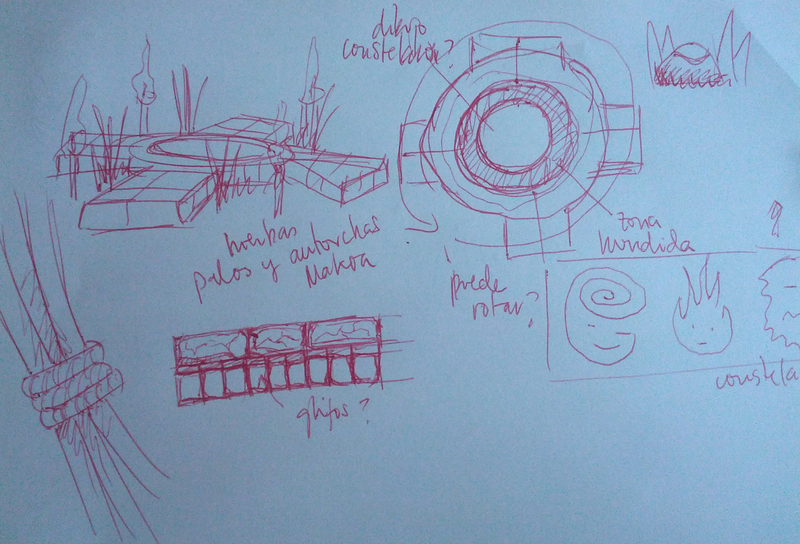 Now we only have to draw the Makoa ideograms inside the circle and in the exterior rings. But we are not going to show you all in this blog. It is better to see it in the game with the light effects and the torch fire. Anyway, we can observe that a common design process (connecting the game scenarios) has created a great 3D model. A model that has a story component too.